GSL Medical College & General Hospital, Rajamahendravaram, one of the premier private Medical Institutions in the country & recognized by MCI / Govt. 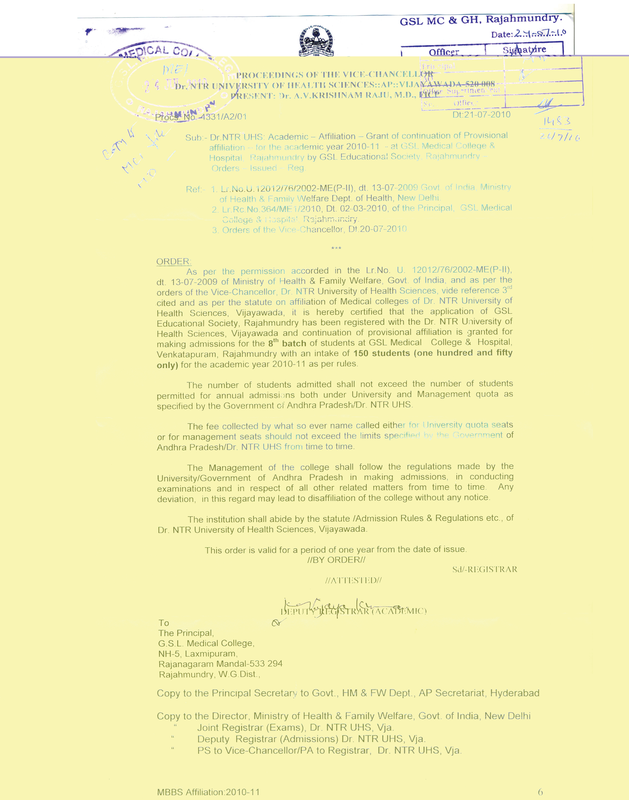 of India is affiliated to Dr.NTR University of Health Sciences, Vijayawada. GSL Medical College is established with a divine mission of bringing Medicare of International Standards to the door steps of the rural poor and to roll out medical graduates of modern scientific medicine capable of functioning independently in both urban or rural environment. GSL is located in salubrious environment abutting National Highway-16. It is 12 km from the historical city, Rajamahendravaram - the Vedic, Cultural & Literary capital of Andhra Pradesh. Rajamahendravaram domestic airport is about 10 km from the college. GSL Medical College & Hospital are built on a sprawling 85 acres picturesque locale. The departments, class rooms, library and laboratories are housed in airy, bright and well ventilated buildings. The interspersing lush green lawns and beautiful gardens provide pleasant, fragrant heavenly atmosphere. The clean, healthy, serene and tranquil surroundings provide ideal foil for excellent academic activity and healing. At GSL we promote self-directed, explorative learning and research at every level. The college is equipped with state of art medical equipments, audiovisual aids and library. Regular CMEs, workshops, seminars and guest lectures by eminent professors drawn from all over the globe form vibrant learning activities are held all through the year. GSL General Hospital (GSL GH) is a thousand bedded tertiary care multi-specialty hospital attached to the College. It was commissioned on 01-01-2002 with the noble objectives of providing urban healthcare facilities to the rural poor at an unbelievably affordable cost and to transform the present rural A.P into a strong, healthy vibrating rural A.P (India). GSL GH is numero uno in coastal Andhra Pradesh for a number of reasons. It is equipped with the latest diagnostic & therapeutic gadgets in the field; it is the first Medical College Hospital which started super-specialty departments simultaneously along with broad specialties. It is empowered by highly competent, skilled and dedicated doctors, nurses and paramedics highly committed to providing quality healthcare. GSLGH is on the verge of creating strategic alliances with reputed universities and health care centers of in this country and abroad to improve its patient care delivery and education objectives. Sri.G.S.Ramakrishna: A first class science graduate from Andhra University. Since 1976 he has been into business and established himself as one of the pioneers in his field in Godavari Districts. He is a dynamic, innovative and hard working businessman with a pleasing manners and excellent communication skills. He is a cool and calculative businessman with scruples and morals. He has excellent managerial skills. Dr.V.Sarath Kumar:The first urologist in Godavari Districts. With excellent entrepreneurial skills he established the first urology nursing home and Kidney foundation in Godavari Districts. He was very successful in educating the masses about urology. He has excellent knowledge about in the medical colleges and is instrumental in building highly appreciative monumental structures for GSL Medical College & General Hospital. He has excellent contacts and is well known for efficient running of the institution. Dr.Kesava Swamy: The first doctor in the coastal districts to have obtained both Allopathic & Ayurvedic Medical degrees. He is a highly successful medical professional with exceptional managerial skills. He is known for his warmth and hospitality. A very popular medical professional with excellent contacts in all sections of the society. He is an ever smiling pleasant personality with an optimistic frame of mind. GSL Medical College is rapidly emerging as the institution of excellence among healthcare institutions of costal Andhra Pradesh. What makes GSL different from others? Serene & tranquil atmosphere, cordial interaction between the students & scholarly teachers and an opportunity to interact with professionals of diverse disciplines - Ayurveda, Homeopathy, Physiotherapy and Nursing under one roof. Highly vibrant academic environment bequeaths students to think beyond visible limits and add value of excellence to whatever they do. The institute gave great impetus to research by creating Research Cell and exhaustive SOP for the benefit of teachers & students. Community oriented problem based learning is an integral part of academic activity at the institution. 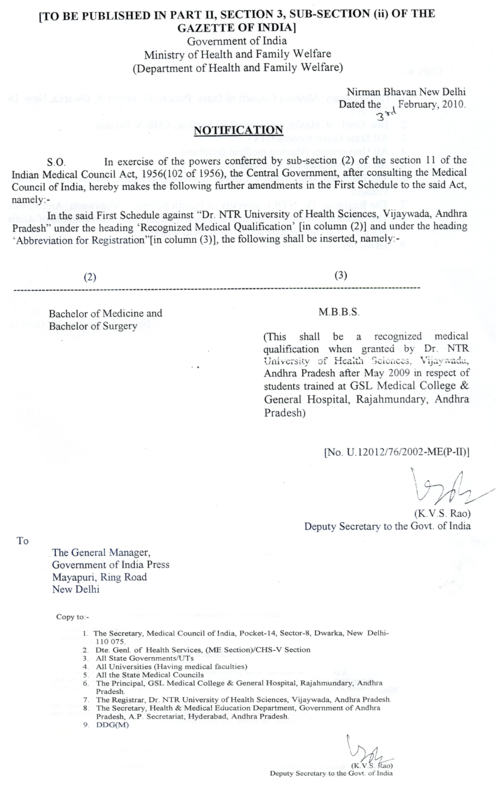 Medical students are encouraged to take up short term studentship of Indian Council of Medical Research. Faculty members at GSL are playing an active role in mentoring students as well as designing co-curricular activities. This has ensured that learning has not stopped in the classroom – but is enhanced outside it. Local Area Network with the latest software tools, e-library and state of art gadgets enables faculty members to structure their curriculum and give the best to their students. GSL thrives to generate globally competitive ‘ready to work’ healthcare professionals. Come and join GSL and realize your academic dreams. 34 years experience in Armed Forces. Held various appointments that include teaching appointments in AFMC for 20 years, Advisor in Pathology & Biochemistry, Commandant of a 800 bedded Military Hospital, DDMS and Station Commander. Published several papers in National & International Journals; Two of them adjudged best papers. Principal/Co-worker in six AFMRC Projects.